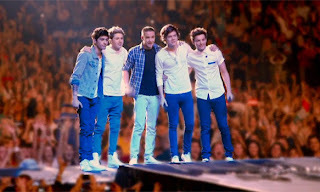 SnapCacklePop: One Direction release 3D movie trailer..! One Direction release 3D movie trailer..! are releasing a documentary style movie of the boys traveling round the world, giving their fans a chance to get up close and personal with the boys on the road. Sure to be a box office hit, the film is set for release on November 8, 2013 at the end of their current world tour. Get ready for further 1D mayhem throughout 2013. Check out the trailer below..!